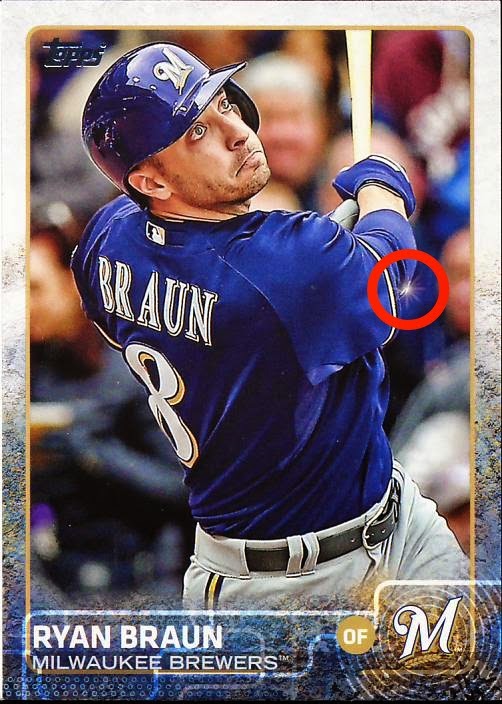 For those of you that said there is a sparkle on Braun’s elbow, you would be correct. For those of you that said the Topps logo had shifted to the other side of the card, you would also be correct. The card that was different was indeed a 2015 Topps Series One Baseball SP Sparkle variation. There is no official word yet, but these seem to be rather rare, falling approximately 1 card in every 2 hobby cases. What has also happened, again without any official explanation, is that on 21 out of the 50 total Series One Sparkle variations, the Topps Logo shifts sides. The Logo shift is consistent for each version, it’s not a printing error on just a few of copies of the card. 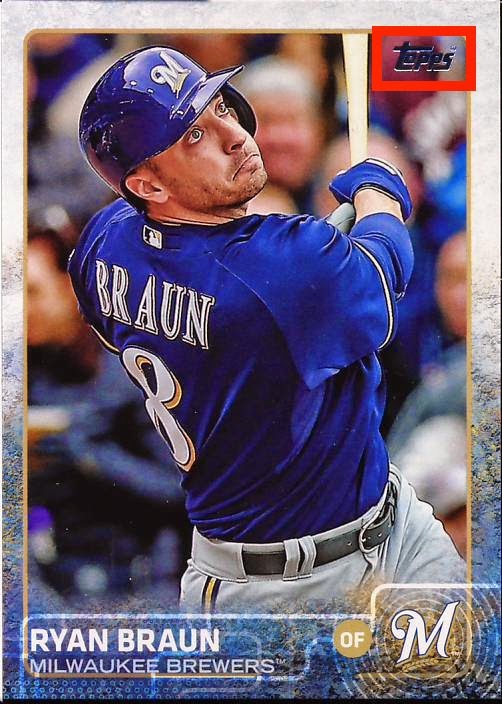 All Ryan Braun base cards have the Topps Logo on the right of the card and all the Ryan Braun Sparkle variations have the Topps Logo on the left. Included in the unannounced SPs along with the sparkles are 25 photo variations. Some of the photo variations have Logo shifts too, but that makes sense. It’s a different photo, sometimes even a different card orientation. What is curious about the Logo shifts on sparkle cards is nothing about the card changes except for the addition of the sparkle and usually those sparkles are not placed in an area that would necessitate shifting the Logo to the other side of the card. A curious case indeed. Here is the complete checklist of Sparkle cards that also have a Logo shift. Tomorrow we will release our Complete Visual Checklist of 2015 Topps Series 1 Baseball Sparkle cards and Photo Variations.